On a frigid morning in Dawson Creek, BC, Senator Larry Campbell took his turn running with the Olympic Torch. 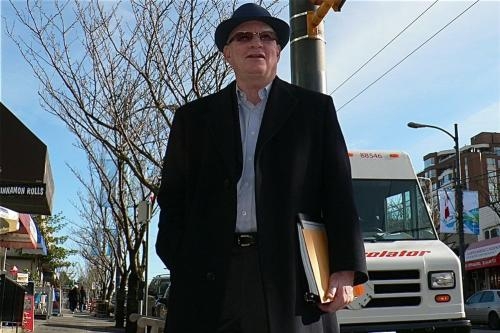 To cheers of "Go, Canada, Go," he carried the flame forward towards Vancouver, a journey that would never have taken place had it not been for his decision to support the Olympic bid when he served as mayor of Vancouver from 2002-2005. Pride and emotion welled up in him as he ran. His thoughts turned to his father. What would he say if he could see him loping along with the torch. And he thought about the late Jack Poole. He wished Jack could have lived to carry the torch. Jack's death left a void inside the senator and the thought of it got him all choked up. Jack was the most amazing man the senator had ever met and he'd have given anything to see Jack carry the torch. And what a ride it had been, from getting elected mayor, to having the Olympics referendum that lots of people didn’t want him to have, and passing the plebiscite with 64 percent of the vote. And then Prague – winning the Games by exactly two votes. It felt like yesterday, and it had been seven years. The senator had already arrived when a reporter arrived to talk with him at Café Muse in Kerrisdale. It was a cloudless winter day and the brilliant sun spot lit Campbell's back, as he pored over a stack of documents. An expensive-looking navy fedora sat on the table, a suggestion of just how far Campbell had come from humble beginnings. Dubbed the "dapper mayor" because of his love of fedoras and long overcoats, Campbell was seen as a progressive who liked to present himself as a centrist. Campbell looked up and smiled. He wore a wool suit, and his bushy eyebrows were neatly trimmed. He had an easy elegance and had mellowed visibly since his boisterous earlier years working as a cop on the drug squad and then later as the city's chief coroner. He played his real life role with such character that it became the basis for the fictional city coroner in the television series, DaVinci's Inquest. The conversation turned to the 2010 Olympic Winter Games. “I think we budgeted properly," he said. "I think we got out in front. And we picked a CEO, just a truly amazing man who I’ve watched grow in this job. John Furlong, to my knowledge, is the only CEO that made it from start to finish. Campbell said he felt proud of the green initiatives that have happened around the Games through Mayor Gregor Robertson, but Campbell said he had initiated at least one of Robertson's best ideas. “I think that Gregor Robertson has it in his genes to be green. And I think he’s continuing, from the bike lane, which first came up when I was the mayor, to greening, to doing in-fills, lane housing, to signing an agreement with Portland to get a green high-speed train. But it's not all rosy, in Campbell's view. “I worry about the amount of money we’re spending on security. The difficulty is that, if something happens, security people will say we didn’t spend enough. If nothing happens, everybody else will say – ‘You know what, we didn’t need all that security.’ Part of security is dealing with issues before they become an issue, never making the headlines. Even Campbell was getting patted down by security before the Games, he said. "I flew over here from one of the Gulf Islands. We had to stop in Ganges, on Salt Spring Island, where I went through scanners, and was pat-searched. I’ve NEVER been pat searched. Remember – this is a Beaver aircraft, so it’s only four of us. "And then from there, we flew to Vancouver. Now, I have to tell you, for islandites, this is REALLY strict. We’re used to getting on with pick axes, propane… I mean, that’s my bus! The funny thing is, if you have a pocketknife, they take it from you and they have a tackle box, which they put it in and lock it and the pilot carries it on the plane. When you land, you get your knife back." Vancouver is safer than most cities, Campbell said, and it's a mistake if people don't look beyond the surface of the Downtown Eastside to the strategies in place to help people. "If you come from a big city, you too have a Downtown Eastside. I point out to people that, while it’s unsightly, it’s not dangerous. We’ve moved to the point where we’re really actively trying to build housing now, after being out of the market since the 1990s, both federally and provincially. We’re trying to deal with the drug addiction on all fronts, we have the first injection site in Canada. This is absolutely a good thing, this is a health care facility. "There’s no place in Vancouver that I can’t walk; there’s no place in Vancouver where I think a woman couldn’t walk. "Certainly, our focus has come on to our difficulties with regards to mental health, homelessness, drug addiction, poverty, inner city kids… Hosting the Olympics forces you to do that. You can’t build a wall around things that you don’t think look good. Not in a democratic society." Campbell still relates to the problems of Vancouver as his own, he said. Public transportation is Campbell's preferred mode of transportation around the city, he said. People regularly recognize him on the bus. Some call him "Larry." Most call him mayor.